Years ago when we were visiting Colombia my cousin and I saved up enough money to buy something sweet at the sweet shop located down the street. Now, we only had enough money to buy one thing, so we had to make our decision wisely. We narrowed it down to two choices, strawberries and cream which I loved and still do. 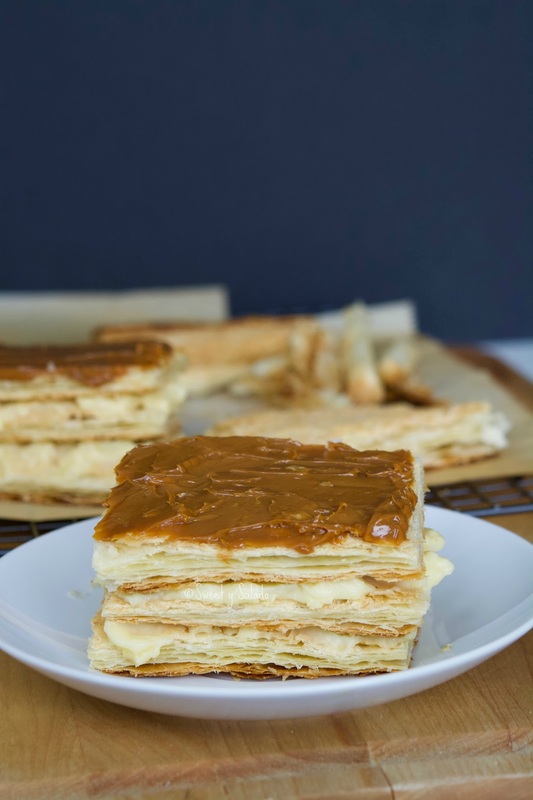 Or this arequipe or dulce de leche milhoja (Napoleon). I had always loved strawberries and cream and had never had a milhoja but my cousin convinced me into trying it out because that was her favorite. I still remember telling her how sure she had to be to pick the milhoja over the strawberries and cream, because remember, we only had enough money to buy one dessert. 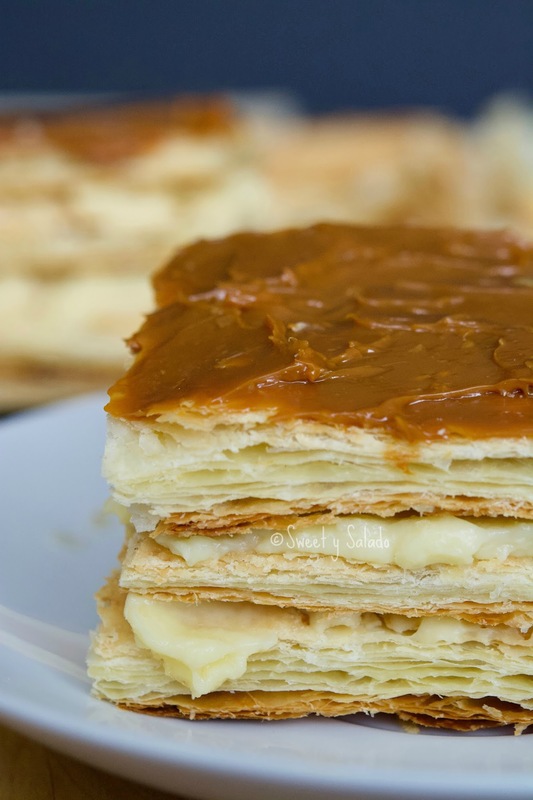 While the lady was getting it for us from behind the counter my cousin explained to me that it was called a milhoja because the puff pastry was so flaky that it looked like it was made out of a thousand leaves. Not only that, she couldn’t stop raving about how delicious the pastry cream and the arequipe were. And she was not mistaken. I loved it so much that ever since that day I always make a point to get one from any local bakery every time we go to Colombia. And I don’t know if it’s because I’m becoming more strict when it comes to buying things from public places, but I always end up saying that the stuff I make at home is way better. There is a reason for that. It’s better because I make everything from scratch. Even though I always use the frozen puff pasty I get at the grocery store, it always comes out delicious. 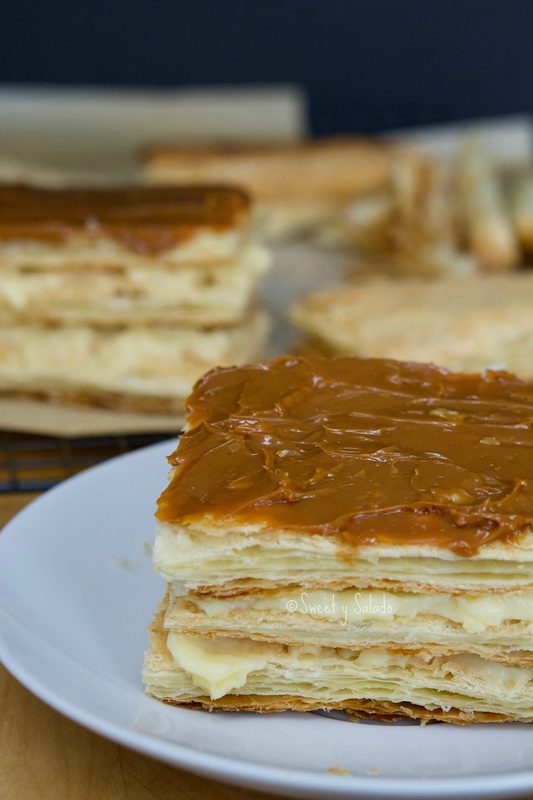 The pastry cream is made to my liking and the arequipe is always delicious, smooth and perfect for making this dessert. Thaw puff pastry according to instructions. (I usually leave it out on the counter for about 30 minutes). Poke the puff pastry sheets with a fork and sprinkle with sugar on top. Bake for 15 minutes or until golden brown. Once you get them out of the oven you can flatten them with the back of a pan or cookie sheet. Let them cool completely. Once it's cool cut the edges of the puff pastry to end up with a perfect square and then cut it into small rectangles using a sharp knife. You will need three rectangles per serving. I usually end up with four servings or 12 pieces total. Spread 2-3 tbsp of pastry cream on two of the rectangles. Place one rectangle on top of the other. 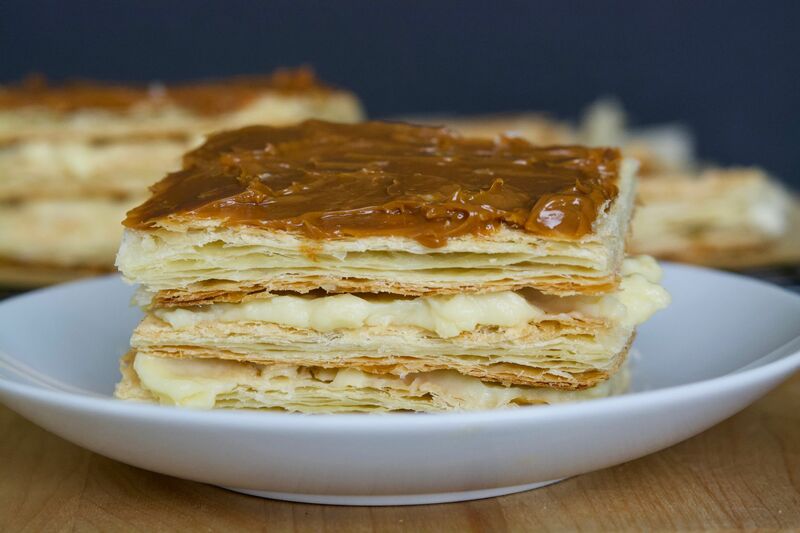 Spread about 2 tbsp arequipe or dulce de leche on the third rectangle, place it on top of the other two pieces and refrigerate until serving.